Running is a great way to explore a new place, meet new people, and see amazing sights! 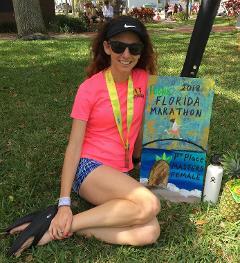 My best marathon memory comes from when I first paced the Treasure Coast Marathon in 2015, and literally went jumping across the finish line because I had had such an amazing time on a beautiful course and felt so fortunate to be able to be a part of my local marathon. The picture that my friend, Suzanne, snapped to capture this moment was completely unplanned, and the photo has served as a happy reminder of that day! I pace because I love running and know that sometimes it takes another person to help you reach your goals. This is a way for me to inspire others to reach further and achieve goals that may have felt impossible to achieve. My best pacing experience was at the New Jersey Marathon in 2017. There was a large group with me for a majority of the race, and afterward, a lady who ran with my group commented that the race felt like a long run among friends because she had such a good time. That was the best compliment I could’ve received! Run with me if you want to have a good time, hear some funny stories, and be cheered on for 26.2 miles! I promise to give you my all and to keep you motivated! Don’t think or worry; leave that to me! Just run and enjoy the race! Take in the sights, the spectators, and the sounds of everything around you. Fun and random fact for those of you who are Bruce Springsteen fans: my grandfather was his high school math teacher!!! 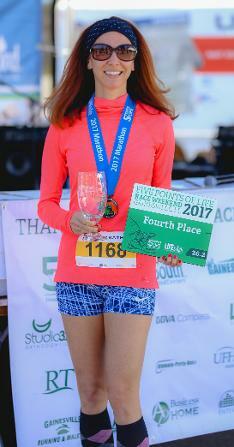 I have participated on three Run to Remember ultra relay teams to honor fallen Coast Guard members and fundraised for the The Cancer Foundation of the Florida Keys, Inc., a 501 (c) (3) organization..